A couple of days ago while on the phone with a friend I had the occasion to look into my stash closet where most of the Mimi-mades are kept. On a hanger hung this sweet fella. It was a UFO. A UFO sooooo close to being finished. 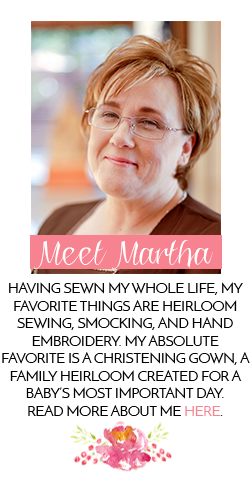 This project was started as a baby gift that never came to fruition. Do you have any of those? I have way too many to count. Anyhoo, I spotted this little gem, realized Peanut is coming for a visit this weekend and motivation struck! 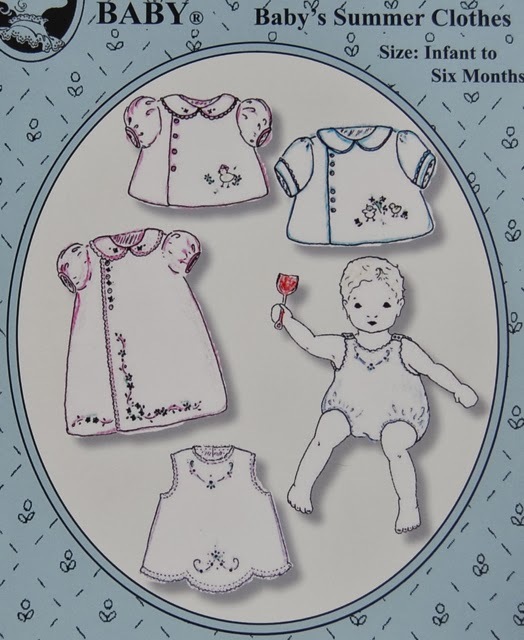 Old Fashioned Baby "Baby's Summer Clothes"
On numerous occasions I have professed my love for patterns by The Old Fashioned Baby. They go together as they should, if it says 16 pounds, it fits 16 pounds. Every time. That being said, this hands down has to be my F.A.V.O.R.I.T.E. pattern Jeannie B has published. Favorite! This is not the first one I have made. It is featured here made from a lawn and poly/cotton pique. Again here from a seersucker and poly/cotton pique. I have a serious crush for this pattern. There is something about the diaper shirt over the romper with those offset buttons that make my heart sing. 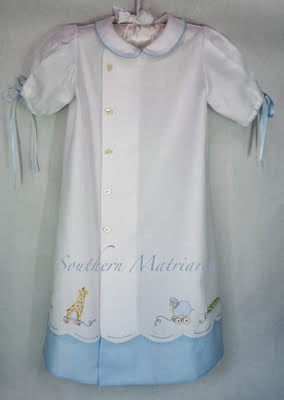 Here is the long version of the diaper shirt for Wildman's coming home gown. 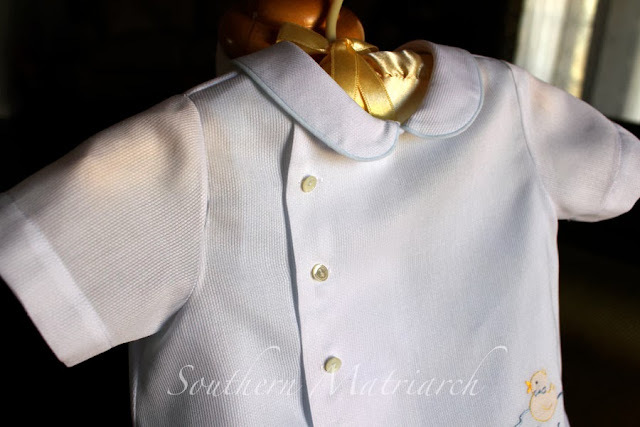 There is also Peanut's coming home gown in the newest issue of Sew Beautiful where I used this pattern to adapt another daygown. Be on the lookout for the new issue. Serious crush on this pattern. Finished! 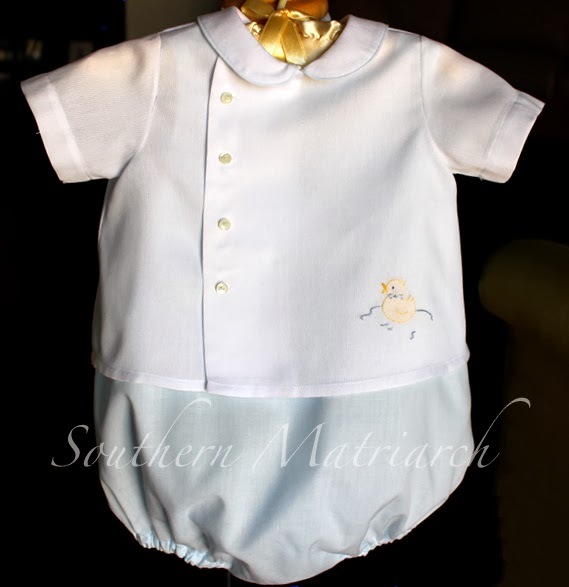 The romper is made from Imperial batiste and the diaper shirt is of course, Spechler-Vogel poly/cotton pique. Antique buttons finish the shirt. I did use snaps on the crotch of the romper. I normally wouldn't, but Peanut goes to daycare. Trying to make diaper changes easier for them. 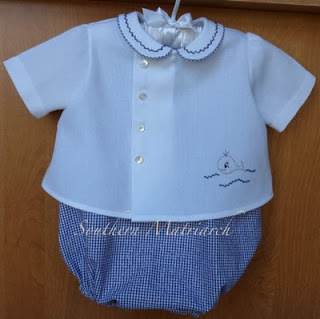 When I found it hanging in the closet, all that was left to finish on this little cutie was sew the buttons and snaps on the shirt and romper then about 30 minutes of embroidery. Like I said, so close. Why hadn't I finished it before? $64,000 question. Isn't he cute? I am cutting it close as to whether this will fit Peanut or not. I sure hope so. If not, it will be waiting on the next arrival. And no we don't have one on the way; but if we did, I am ahead of the game! If you haven't tried this pattern I encourage you to do so. If it doesn't fit, I can make another one that is lengthened in the crotch. It takes no time to make. That pattern sits in my stack of beloved OFB patterns, but I have never made it up. These sweet, sweet outfits have motivated me to put it on the top of the pile and be next in line for any new baby boys who come my way. Thank you Janice, you don't have to wait for a baby boy. 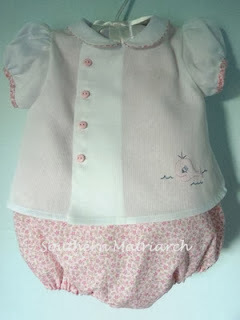 I have made it in pink too with puffed sleeves. Just as darling. I really like the info you present here and can’t wait to take a look when I get home. I’m amazed at how fast your blog loaded on my mobile .. I’m not even using WIFI, just 3G ..
Love them all !!! I do not have that pattern I might have to remedy that. I did have a bubble that just needed crotch snaps to be finished but usually my UFOs need way more work. Thanks, Dawn. I can't believe you don't have this pattern. And believe me, I have some UFO's that would take weeks to finish. Just beautiful, as always! And, yes, I have too many UFO's to count, too! Too sweet! I need to finish UFOs right after I learn to say NO! All of them are lovely! I wonder if I have that pattern. I'm a great fan of Jeannie and have almost all of her patterns. What pattern did you use for the embroidery on the bottom of the long gown? 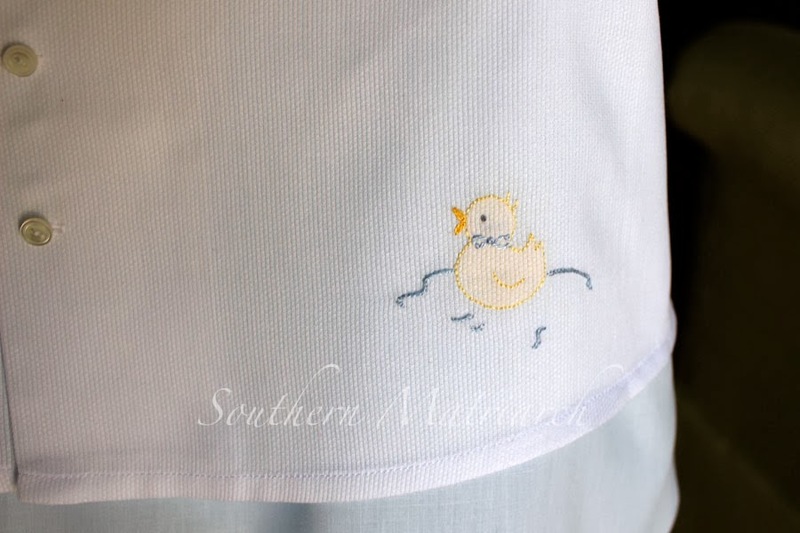 The shadow work on the long coming home gown was from a Shadow work pattern that Wendy Schoen featured in her Embroidery Club several years ago called Madeira Baby Layette. oops forgot to mention if you click on the word "here" that is hyperlinked under the photo of the long gown it will take you to the post that features the details of that gown. Brooke, thank you. No, I don't seek any if them but if you want to email me, I can put you in contact with some that do.